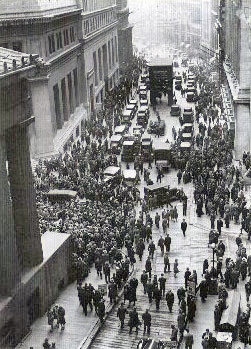 On this date in 1929 the New York Stock Market crashed, memorialized now as Black Tuesday. Wall Street investors traded about 16 million shares on the New York Stock Exchange in a single day. Billions of dollars were lost, wiping out thousands of investors. 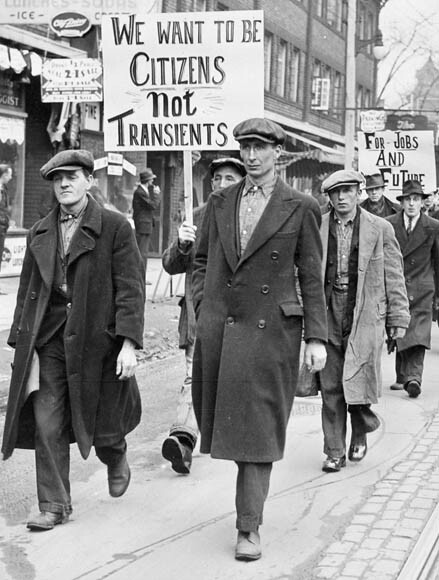 In the aftermath of Black Tuesday, the U.S. and the rest of the industrialized world spiraled downward into the Great Depression (1929-39), the deepest and longest-lasting economic downturn in the history of the Western industrialized world up to that time. Without question, this global economic downturn was one of the precipitating factors in the rise of fascism in Europe and the outbreak of World War II. Furthermore, the war itself was one of the “cures” of the Great Depression. Manufacturing guns and bombs put people back to work, first in Germany, then in the rest of Europe and the United States. FDR’s famed 1933 inaugural speech asserting that it was “fear itself” alone that caused the Great Depression is only partially true. The stock market of the 1920s was a house of cards waiting to collapse. The Roaring Twenties, the decade that followed World War I and led to the Crash, was a time of wealth and excess. During the Roaring 20s, investing in the stock market became a national pastime. From 1922 until right before the crash, the stock market value increased by 218% or nearly 20% a year. Building on post-war optimism, rural Americans migrated to the cities in vast numbers throughout the decade with the hopes of finding a more prosperous life in the ever-growing expansion of the U.S.’s industrial sector. While the U.S. cities prospered, the overproduction of agricultural produce created widespread financial despair among U.S. farmers throughout the decade. This would later be blamed as one of the key factors that led to the 1929 stock market crash. Despite the dangers of speculation, many believed that the stock market would continue to rise forever. On March 25, 1929, after the Federal Reserve warned of excessive speculation, a mini crash occurred as investors started to sell stocks at a rapid pace, exposing the market’s shaky foundation. Two days later, banker Charles E. Mitchell announced his company the National City Bank would provide $25 million in credit to stop the market’s slide. Mitchell’s move brought a temporary halt to the financial crisis and call money (short-term bank credit) declined from 20 to 8 percent. However, the U.S. economy showed ominous signs of trouble: steel production declined, construction was sluggish, automobile sales went down, and consumers were building up high debts because of easy credit. Despite all these economic trouble signs and the market breaks in March and May 1929, stocks resumed their advance in June and the gains continued almost unabated until early September 1929 (the Dow Jones average gained more than 20% between June and September). 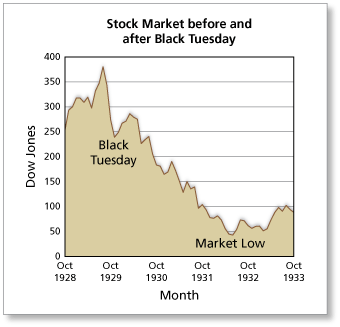 The market had been on a nine-year run that saw the Dow Jones Industrial Average increase in value tenfold, peaking at 381.17 on September 3, 1929. Shortly before the crash, economist Irving Fisher famously proclaimed, “Stock prices have reached what looks like a permanently high plateau.” The optimism and financial gains of the great bull market were shaken after a well publicized early September prediction from financial expert Roger Babson that “a crash was coming.” The initial September decline was thus called the “Babson Break” in the press. This was the start of the Great Crash, although until the severe phase of the crash in October, many investors regarded the September “Babson Break” as a “healthy correction” and buying opportunity. On September 20, the London Stock Exchange crashed when top British investor Clarence Hatry and many of his associates were jailed for fraud and forgery. The London crash greatly weakened the optimism of U.S. investment in markets overseas. In the days leading up to the crash, the market was severely unstable. Periods of selling and high volumes were interspersed with brief periods of rising prices and recovery. Even before the New York Stock Exchange opened, investors were panicky. The Dow Jones Industrial Average had fallen 4.6% the day before. The Washington Post headline screamed, “Huge Selling Wave Creates Near-Panic as Stocks Collapse.” The market opened at 305.85. It immediately fell 11% during intra-day trading. The huge volume meant that the report of prices on the ticker tape in brokerage offices around the nation was hours late, so investors had no idea what most stocks were actually trading for at that moment, increasing panic. Several leading Wall Street bankers met to find a solution to the panic and chaos on the trading floor. The meeting included Thomas W. Lamont, acting head of Morgan Bank; Albert Wiggin, head of the Chase National Bank; and Charles E. Mitchell, president of the National City Bank of New York. They chose Richard Whitney, vice president of the Exchange, to act on their behalf. With the bankers’ financial resources behind him, Whitney placed a bid to purchase a large block of shares in U.S. Steel at a price well above the current market. As traders watched, Whitney then placed similar bids on other “blue chip” stocks. This tactic was similar to one that ended the Panic of 1907. It succeeded in halting the slide. The Dow Jones Industrial Average recovered, closing with it down only 6.38 points for the day. The rally continued on Friday, October 25th, and the half day session on Saturday the 26th but, unlike that of 1907, the respite was only temporary. Over the weekend, the events were covered by the newspapers across the United States. On October 28, “Black Monday,” more investors facing margin calls decided to get out of the market, and the slide continued with a record loss in the Dow for the day of 38.33 points, or 13%. 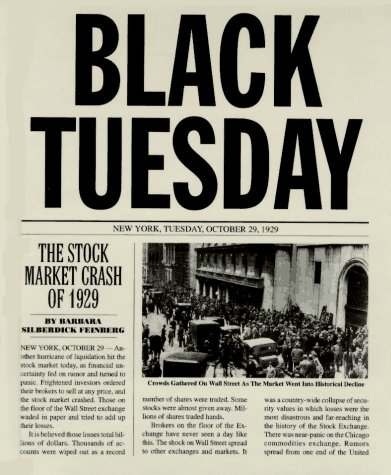 The next day, “Black Tuesday”, October 29, 1929, about 16 million shares traded as the panic selling reached its peak. Some stocks actually had no buyers at any price that day (“air pockets”). The Dow lost an additional 30 points, or 12%. The volume of stocks traded on October 29, 1929 was a record that was not broken for nearly 40 years. On October 29, William C. Durant joined with members of the Rockefeller family and other financial giants to buy large quantities of stocks to demonstrate to the public their confidence in the market, but their efforts failed to stop the large decline in prices. Due to the massive volume of stocks traded that day, the ticker did not stop running until about 7:45 p.m. that evening. The market had lost over $30 billion in the space of two days which included $14 billion on October 29 alone. After a one-day recovery on October 30, where the Dow regained an additional 28.40 points, or 12 percent, to close at 258.47, the market continued to fall, arriving at an interim bottom on November 13, 1929, with the Dow closing at 198.60. The market then recovered for several months, starting on November 14, with the Dow gaining 18.59 points to close at 217.28, and reaching a secondary closing peak (i.e., bear market rally) of 294.07 on April 17, 1930. The following year, the Dow embarked on another, much longer, steady slide from April 1931 to July 8, 1932 when it closed at 41.22—its lowest level of the 20th century, concluding an 89% loss rate for all of the market’s stocks. I thank my lucky stars that I did not have to live through the aftermath of Black Tuesday, but my parents and their generation did. The events of that time created a mindset that never faded. There are regulations in place now to prevent similar events happening again, but they are eroding due to the incessant desire of some people to profit quickly at the expense of others, and to do so they need the banks and the markets to be deregulated. For everyone’s sake, I hope it does not take another crash and another depression to bring people to their senses – but I am not holding my breath. Trying to win big in the stock market is just like trying to win big at a casino. Once in a while someone does, but most people don’t. Trying to rig the system so that everyone wins all the time is just foolishness and has catastrophic consequences. Sadly, people never learn. It’s not exactly laudable to celebrate Black Tuesday, but we can at least celebrate Lower Manhattan where Wall Street is located. New Yorkers like to tout the Big Apple as a foodie city. It is and it isn’t. Sure, there are cascades of “ethnic” food joints scattered throughout the city. I frequented Filipino, Thai, Chinese, Japanese, Russian, Turkish, Nepalese, Tibetan, and Nigerian restaurants in Lower Manhattan, Flushing, and Jackson Heights for years, and pretty much loved them all. But would you call this New York food? Hardly. 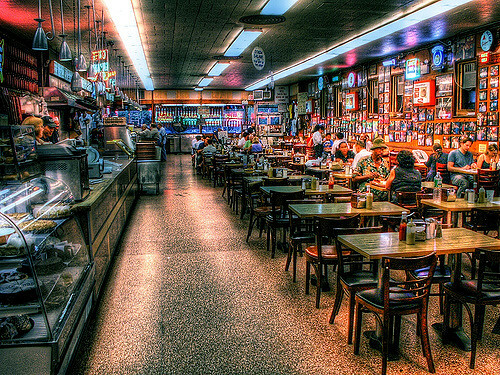 For me Lower Manhattan is the home of the Jewish deli, and the most famous of all these days is Katz’s on the Lower East Side. It’s just under 2 miles from Wall Street, but traders make the trek sometimes (cab or subway) because the food is unbeatable. 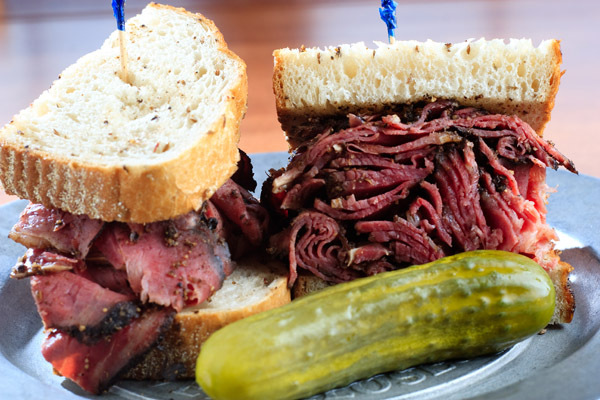 The classic sandwich for me is pastrami on rye with mustard and a kosher pickle. Katz’s slowly simmers the pastrami and then hand slices it thin and serves it warm in thick, moist piles. It’s not impossible to come close at home, but you won’t exactly replicate the original. Get a whole pastrami brisket and poach it very gently, covered, in plain water for about 1 to 2 hours. Don’t be aggressive. Bring the pot very slowly, over the lowest heat, to a gentle murmur. The brisket is ready to eat cold; you are just heating it through and tenderizing a little. Slicing is the trick. You need a very sharp knife. Cut the brisket across the grain as thinly as possible. Pile it high on fresh rye bread spread with whole grain deli mustard. Serve with a kosher deli pickle. I have visions of hot pastrami on rye in my sleep sometimes. It’s been over 8 years since I had one. In the neighborhood of Katz’s are also some great stores to buy lox (smoked salmon). So if you are not in the mood for meat, head to Russ and Daughters and get lox with cream cheese on a bagel. You won’t get the quality of smoked salmon at your local store, but you can make a fair replica at home of the original. 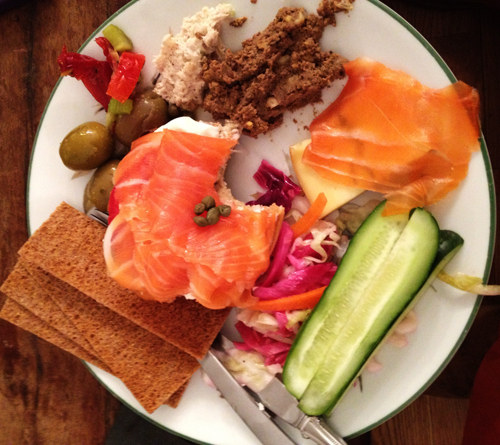 The secret is always in the quality of the bagel and the lox.